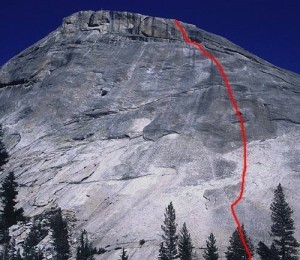 This is one of the few well-bolted face routes in Tuolumne and a great introduction to face climbing. Bring gear for the last pitches and a 60m rope. Which SuperTopo guidebooks include a topo for Zee Tree? The Dike Route follows the runout line up the white dike on Pywiack Dome. Aqua Knobby follows the knobs and flakes up the water streak on the north side of Pywiack Dome. Needle Spoon is just left of the Dike route.